The House of Giovan Maria Salati is located in Via Eria, in Malesco. 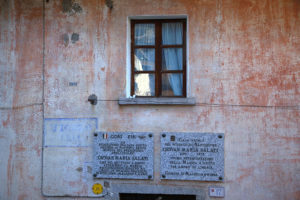 Walking along the streets of the village, it is easy to find a marble slab on the wall of a house: in 1989 the Municipality dedicated a commemorative plaque to Giovan Maria Salati to honor his memory. Are you wondering who is Giovan Maria Salati and why dedicate him a gravestone? Giovan Maria Salati was born in 1796 in Malesco and emigrated to France as a young soldier of Napoleon. In 1817, the navy rifleman was captured by the British, who locked him in a prison in Dover, United Kingdom, on the shores of the ocean. Dover’s position is the reason why Giovan Maria Salati passed to history: Dover, indeed, is located in the southeastern part of the UK island, Kent County, and is the location of one of the most important ports of the nation, thanks to its incredible proximity to France. The White Cliffs of Dover and Calais are separated by 34 km and exactly these 34 km were swimmed by Giovan Maria Salati to escape his jailers. This endeavour made him the first man in history who crossed the English Channel by swimming in 1817 and still today, for this crossing, he is considered the pioneer of the long-distance swimming, according to the Italian Swimming Federation. Swimming was not the specialty of Giovan Maria Salati: until the departure with the Napoleonic army, he was shepherd in Malesco and learned how to swim in the cold rivers of the Valle Vigezzo. When he arrived in France, became a chemneysweeper, as evidenced by the testimonies of the time. He had a priest son, who he followed in his relocations until the Saint Brice sous Foret village, where he died in 1879. The House of Giovanni Maria Salati is among the remarkable buildings that can be admired by going through the streets of Malesco. Each of them gives to the village a piece of history and contributes to create this unique corner of Valle Vigezzo. The House is now a private residence and is therefore only visible externally. Visible externally throughout the year.